Ideal for adding a dash of refreshingly modern design to your home, this ceramic pot can serve a variety of purposes. The 2 water draining holes and the removable water draining tray make it ideal for housing live plants, but it can also be a display tray for items like potpourri, candles, seashells, and more. The simple, minimalist design is easy to pair it with any interior design, and highlights what is placed inside of the pot rather than the pot itself. Give this planter as a sweet gift to a friend with a green thumb or keep it in your own home for a touch of clean, modern style in your living space. 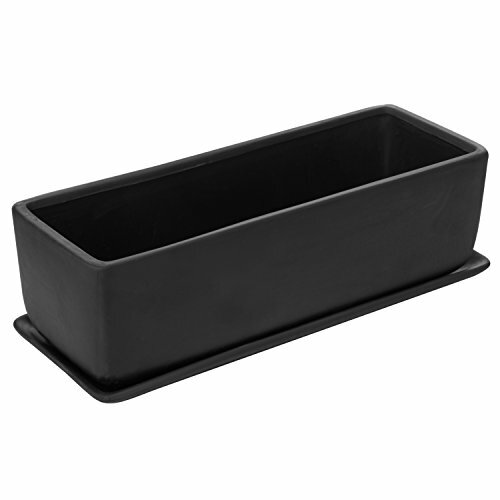 MODERN SIMPLICITY: Bring clean lines and minimalist style to your home decor with this modern ceramic planter box. INDOOR SUCCULENT POTS : Features ample potting room, removable draining tray, and 2 draining holes to help promote healthy plant life. VERSATILE PLANTER: Perfectly displays live potted plants, flowers, or even home decor. DECORATIVE ACCENT: Minimalist design makes this pot ideal for small spaces such as desktops, shelves, windowsills, and countertops. SPECS: Overall - 14.6 L x 5.1 H x 6.1 D; Planter Box - 14 L x 4.1 H X 5.5 D; Saucer - 14.6 L x 1 H x 6.1 D (in inches).